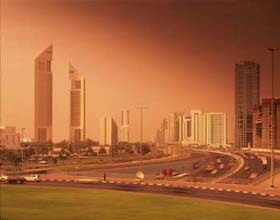 We lived and worked in Dubai in the United Arab Emirates. We moved there in 2002 after 19 years in Muscat. We stayed in Dubai for 14 years until we retired in 2014. There's only 4 hours driving time between Dubai and Muscat but the two places are totally different. It's not that one is better or worse than the other, just very different. Muscat is a village, everybody knows each other. The place is quiet and extremely comfortable. 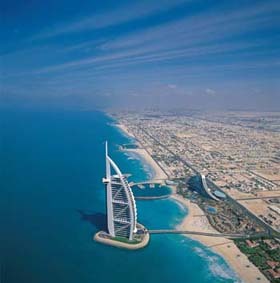 Dubai on the other hand, is a big place and it is growing and developing faster than any other place on earth. Apart from becoming one of the worlds leading holiday resorts, it's clear that they also intend hosting all of the most important sporting events, exhibitions and shows. It's interesting to note that the two pictures to the right were reasonably up to date when I first put this page together about five years ago, now both views are seriously different. I'll have to find some more recent pictures. We did have a house in Jebel Ali Village, shown at the top of this page. JA Village was undoubtedly the best place in Dubai to live. It was built almost thirty years ago as senior staff accommodation for the contractors that built Jebel Ali Port and free zone. There was a proper village-green with duck pond, a school, recreation centre, clinic and pharmacy and supermarket. The houses were generally three or four bedroom and built on large plots with garden on four sides. There was an extensive waiting list of people who wanted to live in the village. Now sadly the place is derelict, we were given notice and we all had to leave in August 2008 because the place was to be re-developed. There were many people that had lived in the village for twenty years or more. The sudden uncaring disruption caused all sorts of problems. Disappointing because maybe it shouldn't have happened the way it did. There were a number of companies that had been involved in the building of the port and still had their original hold on the houses. There were about 60% of the houses occupied at ridiculously low rents. The company accountants thought this was great but for the landlord (JAFZA) it was difficult and perhaps if the houses were let at a more realistic rent the redevelopment could have waited a short time. Also, the 'credit crunch' has meant that the developer has cut-back. Maybe if the notice had been a bit later or the worldwide financial troubles a bit sooner, the village might have continued for a few years. Another rant; apologies for that, please read on. It's only a few years ago that people would try to avoid a trip to Jebel Ali because it was considered such a long way out of town. Now the road is very significantly improved, and also Dubai has spread out to such an extent that Jebel Ali is now a part of the city. The metro line zooms past Jebel Ali village, a little way up the road is Jebel Ali Palm, further on than that is Dubai Waterfront project, behind the village is the new Jebel Ali airport and just started is the massive Arabian Canal project. Down the road in Bur Dubai is the Creek extension which is a big project but only a garden pond compared to the canal, don't get the two mixed-up! From 2002 to 2008 I worked as Service Manager at the Dubai Komatsu and JCB dealership, then worked till 2014 with a very big UK EPC Contractor. Susan is worked with a major oil company.